COLUMBIA, SC (WIS) – Richland County deputies are searching for a 13-year-old girl who hasn’t been seen in a few days. Stevena English, of Elgin, was last seen on surveillance video leaving her home around 2:45 a.m. on April 13th. COLUMBIA, SC (WIS) – Columbia Police Chief Skip Holbrook is asking for community assistance to locate a missing 56-year-old woman. Aeron Young was last seen walking away from her home on Oceola Street on the morning of February 4th. A search is underway for a 24-year-old woman reported missing over the weekend. Porscha LeAnn Hardy, 24, was reported missing after dropping her child off at a local daycare center on December 15. The Columbia Police Department is looking for a missing teenager, and is seeking the public’s assistance in locating her. 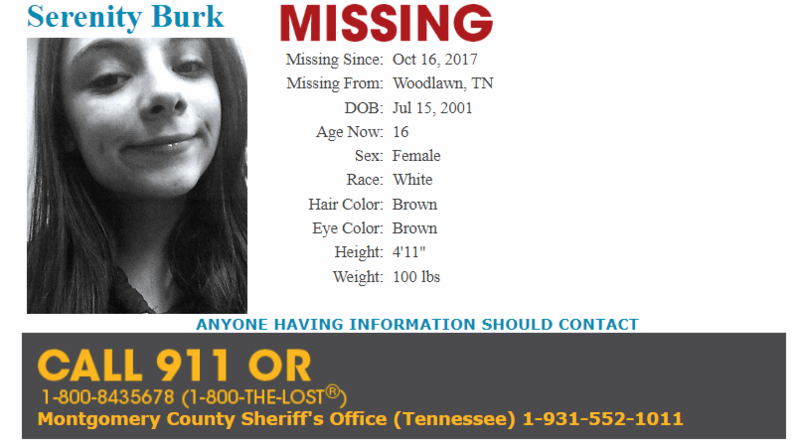 Serenity Burk, 17, was last seen on Nov. 15 leaving school in Columbia. More than a week later, her whereabouts remain unknown. The Columbia Police Department is asking the community to remain vigilant and contact the authorities if she is seen. COLUMBIA, Tenn. (WZTV) — Columbia Police are asking people to be on the lookout for a woman who has last heard from a few days ago. Edna Dubree, 48, was last seen on Sept. 7. COLUMBIA, SC (WACH) – The search is now underway for a missing woman who is hearing impaired, according to the Columbia Police Department. Eighteen-year-old Anna Wilson was reported missing Thursday, May 5 by her father and was last seen at 2015 Main Street July 2. Columbia, S.C. (WOLO) – Columbia Police are looking for a man who has been missing since May 30th. Officials say Charlie Nguyen was last seen as a home on Duke Ave. last month.